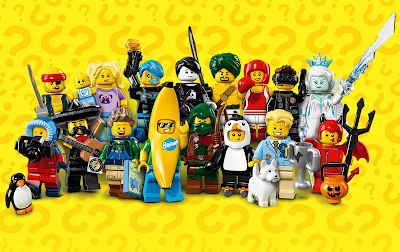 LEGO Minifigures Series 16 was released this month, and once again the theme hits the high marks for originality that I've come to expect of these series. The more specialized licensed Minifigures series (The Simpsons, The LEGO Movie, Disney) rarely have many characters that I want to collect, but these regular numbered series pretty consistently include 50%-75% that I would consider must-haves, and rarely have more than a couple that I'm completely indifferent to. Babysitter: The baby minifigure was introduced in the recent Fun in the Park set, but here it gets the added detail of a printed bib. It is composed of only two pieces, the head and body. (The yellow hands are produced by two-color molding). The babysitter comes with a cute shirt printed with a bespectacled pug's face--a detail that will make her appealing to many dog fans who might otherwise pass on the baby figure. Banana Guy: This figure falls into the same general category as Series 13's Hot Dog Man, with a single large piece defining the costume. It's a must-have if you collect the silly costumes featured throughout this theme, but it's not a part that can easily be used anywhere else. Cute Little Devil: This is one of my two favorites in this series. The wings are the same as the Series 14 Gargoyle's, but in red. The figure also comes with a horned hood and a barbed tail. A D&D imp can be made by substituting in a scarier head, such as the devil heads from the old Monsters 4 LEGO Game. Alternately, build a Medium-sized devil by putting the horns, wings, and tail on one of the red-skinned villains from Nexo Knights, or one of the red-skinned Uruk-Hai from The Lord of the Rings theme. Cyborg: This character has detailed circuitry on her face, arms, legs, and chest plate, making her very distinctive from all previously produced cyborgs or robots. If you're not running a SF game, then her silver-streaked blue hair might still be a useful piece, particularly for an aquatic elf or Pathfinder gnome or undine. Desert Warrior: This character is a fairly simple, but very nicely detailed, Arabian warrior, suitable for a palace or harem guard, or a flashy street tough. The mostly bare torso would work well for a musclebound hero from a wide range of eras. Dog Show Winner: The terrier (whose feet conceal two anti-studs) is a new part, as is the owner's groomed hair. This minifigure was a big hit with my son, who adores any kind of cute LEGO animal. Hiker: The hiker comes with a new backpack design, messy hair (in a new color from its appearance in Fun in the Park), and a neat little compass printed on a 1x1 clear tile. His map is labelled "Greeble Trail," which refers to extra details built onto the surface of a model to give it a more interesting appearance. Kickboxer: This character is the female counterpart to the boxer from Series 5, and has the same red boxing gloves and helmet. This figure, however, also comes with hair, plus a 1x1 cylinder brick to mount the helmet on when not being worn. Mariachi: This figure uses the same handlebar mustache as the Series 13 sheriff, and the sombrero from Taco Tuesday Guy (The LEGO Movie Minifigures), both in black for the first time. However, the real gem here is his guitar: after years with only electric guitars available, we finally get an acoustic one! Penguin Boy: This minifigure has flippers like those from the Shark Suit Guy from Series 15. To turn him into a giant penguin mini, simply remove the ice skates and substitute a blank white head (or one turned backwards). Rogue: This figure has a high degree of detail, done in a combination of printing and two-part injection molding. The best example of this is the short red cloak printed on his torso being continued over the arm by molding the shoulder in matching plastic. He also has a very nice hood with attached facemask. After all those nice touches, it's almost disappointing that his quiver and bow are just the standard Castle accessories. Scallywag Pirate: At first glance, this pirate doesn't seem that different from any other in the Pirates theme. However, his pants are two-colored plastic with painted stripes, he has an anchor tattoo on his arm, the map is a new tile design, and his headband includes a bald pate. Spooky Boy: This pale-skinned, one-fanged vampire kid has a very emo expression. He comes with a book titled "Spooky Tales," a pet spider, and a shirt with a LEGO skeleton skull. This character was an instant favorite for my preteen proto-goth daughter, who also adored Series 12's Spooky Girl. Spy: The spy's jumpsuit has some nice printed details, but his most distinctive feature is his hair, which includes small divots for attaching a visor. This is the first such hairpiece the LEGO Group has produced, and it would also work very nicely with parts such as the goggles from an aviator's helmet. Wildlife Photographer: This minifigure comes with a parka and snow pants that make use of two-color molding. She also has a two-sided head, one face with goggles and the other with one eye shut to look through her camera (which gains a zoom lens by attaching a 1x1 round plate with a hole in the stud). The best part of this character, though, is the penguin. The stud on its back begs to be used for something crazy, like giving it wings or a jetpack!